You must make reservations at least 5 minutes in advance of the time at Sabatino's. Street parking is free for up to 3 hours. We also offer Valet Parking for $10.00 per car beginning at 3:00 PM on Sunday and beginning at 5:00 PM on Monday - Saturday. There are also 3 large "pay lots' within 2 blocks of Sabatino's. The closest pay lot is also the most cost efficient. It is $4.00 per car after 4:00 PM weekdays and all day on Saturday and Sunday. This lot is on the Corner of Central Ave and Bank St. Enter the lot from Central Ave.
Sabatino"s offers a wide range of limited service catering entree options. We deliver Party Trays hot and ready to serve daily from 10:30 AM until 11:00 PM to businesses in the Baltimore Metropolitan Area. We require just a few hours notice to deliver lunch or dinner to your corporate group of 15 - 500! Check out the Party Tray/Catering menu on our website at www.sabatinos.com or contact a manager at 410-727-2667! Sabatino's has been hosting corporate and special occasion groups in Private Dining Rooms for over 40 years! We have PRIVATE ROOMS that can comfortably seat 20 - 150 guests and our full service event planner, Lisa, can assist you with planning every aspect of your event! Whether you're hosting a Corporate Meeting, celebrating a Birthday or Graduation, planning a Rehearsal Dinner or just gathering a large group of family and friends, Sabatino's has a group dining option and a menu to suit your needs. There is a comprehensive section on Private Dining on our website at www.sabatinos.com. There you will find menu options, enhancements, photos of our Private Dining Rooms and sample printed menus. You can contact Lisa Monday - Friday during the day at 410-727-2667 or speak with any manager if she is not available. We look forward to working with you to plan festive and memorable events! 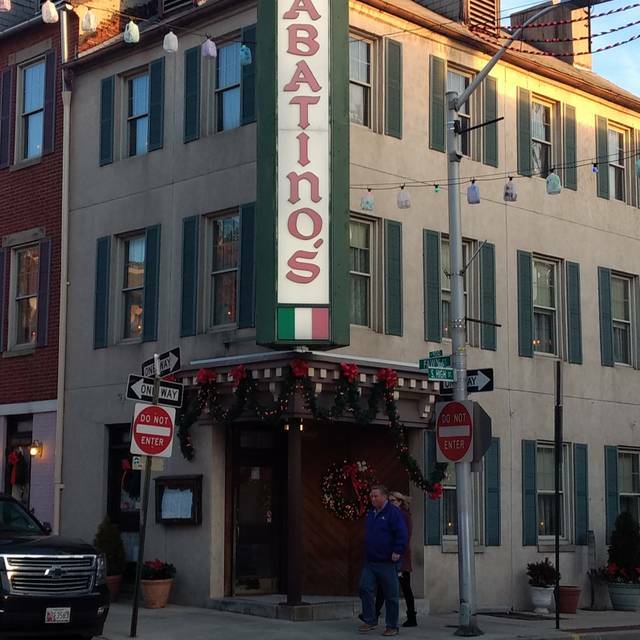 Located in the heart of Baltimore"s famous Little Italy, Sabatino's has been serving Baltimore locals and tourists delicious Central and Southern Italian fare for over 50 years! Whether you're out for an intimate dinner for two, a family gathering, or hosting a larger group in a Private Dining Room, Sabatino's gives you the ambiance you're after. Sabatino's has been consistently voted the People's Choice for Best Italian Restaurant and recently received the Editor's Choice for Best Italian Restaurant by the Baltimore City Paper. "Consistency and integrity are what drove us to give Sabatino's the Best Italian nod... This is Italian without apology: Tongue-tingling Penne and Vodka Sauce; Veal Florentino avalanched in dreamy cheeses; piquant scalloppines, and crisp-baked parmigianas - This is the real deal, served in an environment (a row house int he heart of Little Italy) that's as honest as the food. Join us for lunch, dinner, or late-night dining! Buon Appetito!!! Tender fresh water snails sauteed in a garlic, lemon & butter sauce. Jumbo steamed shrimp served with cocktail sauce. (For 2) lightly seasoned jumbo steamed shrimp served on a bed of lettuce with olive oil in a light vinaigrette dressing. A generous sized garden salad. Jumbo shrimp butterflied and broiled in a light wine sauce with a hint of brandy, topped with melted mozzarella cheese and prosciutto. Breaded and lightly seasoned with Italian spices and served with homemade marinara sauce. Fresh honeydew melon draped with thinly sliced imported prosciutto. A medley of seafood including lobster, clams, escargot and shrimp served in a butter, garlic and white wine sauce. Clams on the half shell broiled in a special blend of clam sauce, bread crumbs, grated parmesan cheese and prosciutto. Fresh tender squid lightly floured then deep fried, served with lemon wedges and homemade marinara sauce. A full plate of steamed mussels served in a white wine, garlic and butter sauce. Sweet italian sausage sautéed with fresh green peppers. 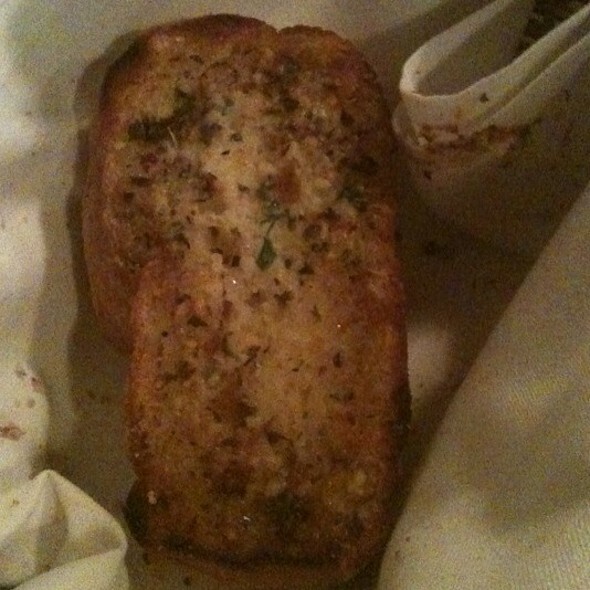 Italian bread topped with Sabatino's Award Winning blend of butter, fresh garlic, grated cheese and fresh spices. Topped with virgin olive oil, fresh basil and spices. A sampling of our most popular appetizers including Clams Casino, Shrimp Renato, and Sauteed Sausage & Green Peppers or Green Peppers & Anchovies served with wedges of garlic bread. A large garden salad accented with shrimp, Genoa Salami, provolone cheese and a hard boiled egg, served with Sabatino's House Dressing. Hearty Italian, meat based vegetable soup. Spinach sauteed in olive oil and garlic with pimentos, pepperoncini, prosciutto and olives. Homemade pasta served with tomato or marinara sauce. Homemade fettuccine noodles served in our famous butter, cream and cheese sauce. Homemade fettuccine noodles served in a shrimp alfredo sauce. Homemade pasta ribbons layered with tomato sauce, ricotta and mozzarella cheeses, ground veal, salami and mushrooms. 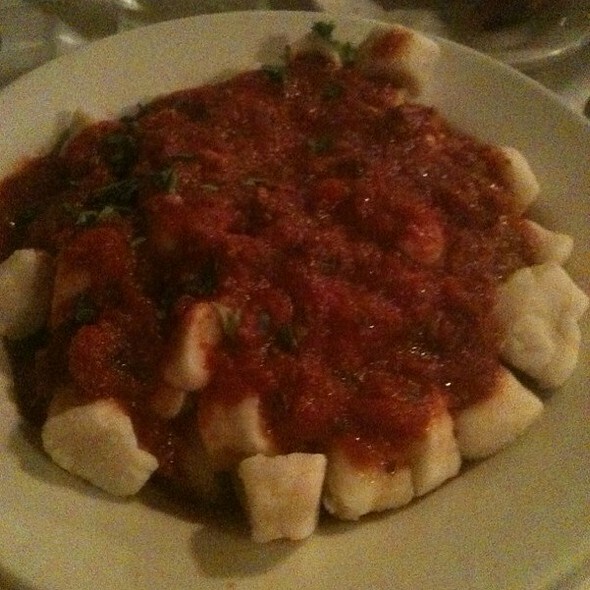 Ricotta cheese dumplings served with tomato sauce. Homemade pasta pillows stuffed with a blend of cheeses and spices, topped with tomato sauce. Homemade pasta pillows stuffed with a blend of ground veal, spinach, cheese and spices topped with tomato sauce. 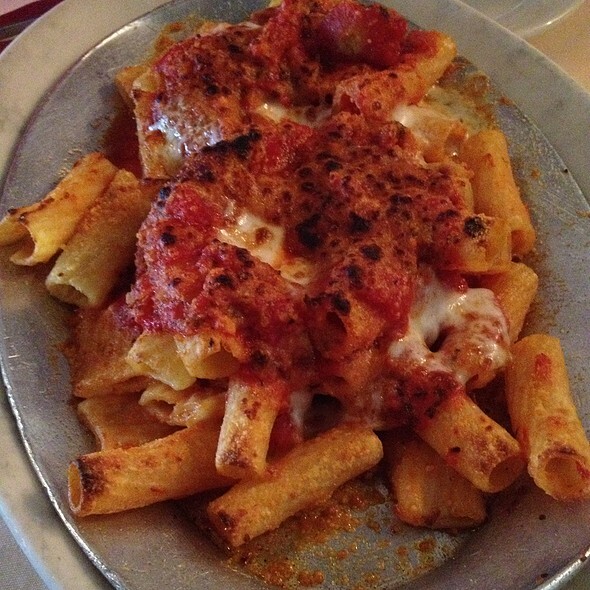 Wide strips of homemade pasta rolled and stuffed with a blend of ricotta cheese and spices, topped with tomato sauce. Fresh sliced eggplant fried until tender and layered with mozzarella and marinara sauce, baked to perfection and served with a side order of spaghetti. Spaghetti, rigatoni, linguini, shells, capellini or penne $0.50 Extra. Doughnut shaped pasta stuffed with meat and cheese served in a rich tomato cream sauce with ground veal, peas, carrots, mushrooms and onions. Imported Italian semolina rigatoni tossed with mozzarella and provolone cheeses, topped with tomato sauce and grated parmesan cheese and baked to perfection. Imported penne pasta served in a creamy tomato and cheese sauce with a hint of vodka. All of the below poultry entrées served with your choice of spaghetti with tomato sauce or french fries or salad. House dressing $0.50 extra. A boneless breast of chicken lightly breaded, pan browned, topped with melted mozzarella cheese and tomato sauce. Rigatoni pasta topped with bite sized pieces of boneless chicken and broccoli in a rich, creamy alfredo sauce. Penne pasta tossed with pieces of broiled breast of chicken, peas, mushrooms, carrots and onions in a very light white wine sauce. All of the below beef and pork entrées served with your choice of spaghetti with tomato sauce or french fries or salad. House dressing $0.50 extra. A 16oz. Steak hand cut and charbroiled to your specification. A 12oz. Steak hand cut and charbroiled to your specification. A 16oz. Steak hand cut and charbroiled to your specification bathed in a white wine sauce with mushrooms and green peppers. A tender beef roll stuffed with veal, prosciutto, hard boiled egg, parmesan and provolone cheeses, topped with marinara sauce, mushrooms and green peppers. Our homemade meat balls served in fresh tomato sauce. Sweet italian sausage sauteed with fresh green peppers. All of the below Veal entrées served with your choice of spaghetti with tomato sauce or french fries or salad. House dressing $0.50 extra. 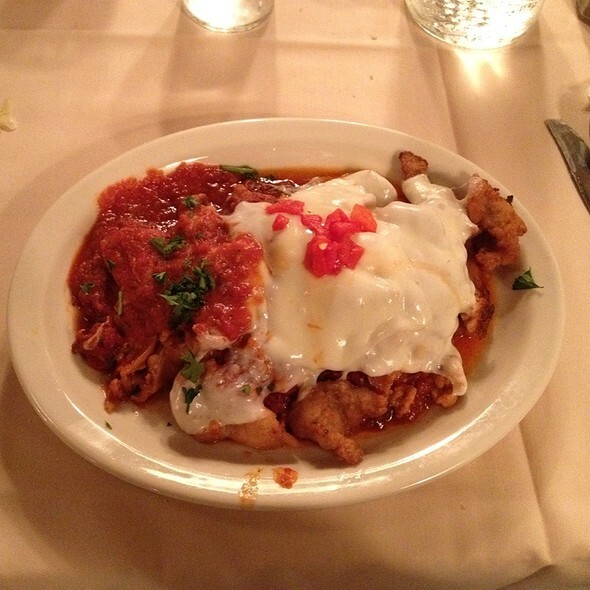 Tender medallions of veal lightly breaded, pan browned, topped with homemade tomato sauce and melted mozzarella cheese. Thin slices of pan browned veal simmered in a delicate white wine sauce, topped with sauteed mushrooms, green peppers and prosciutto. Tenderloin veal medallions simmered in a light wine and brandy sauce, topped with fresh mushroom caps and pimentos. Tender veal chop broiled to your liking, served with fresh mushrooms and italian style potatoes. Tender pieces of veal served in a zesty marinara sauce with mushrooms and green peppers. Thinly sliced veal sauteed in a white wine sauce, served over a bed of spinach with melted mozzarella cheese and prosciutto. Tender medallions of veal sauteed in a delicate white wine sauce with melted mozzarella cheese and prosciutto. Fresh sliced eggplant fried to crisp tenderness and layered with marinara sauce and mozzarella cheese, within medallions of tender veal, baked to perfection. Tender medallions of veal lightly breaded, pan browned in a sauce of white wine and lemon with prosciutto. All of the below seafood entrées served with your choice of spaghetti with tomato sauce or french fries or salad. House dressing $0.50 Extra. Jumbo shrimp lightly breaded and deep fried to a golden brown, topped with homemade marinara sauce and melted mozzarella cheese. Jumbo shrimp served in our homemade marinara sauce accented with mushrooms and green peppers, accompanied by garlic bread wedges. Shrimp lightly breaded then deep fried until golden brown. A generous portion of fresh, tender squid served in a blend of italian tomatoes, virgin olive oil and spices. A generous portion of fresh, tender squid lightly floured then deep fried, served with lemon wedges and homemade marinara sauce. Fresh fish of the day. Jumbo shrimp butterflied and sauteed in a delicious blend of fresh garlic, lemon and white wine and a hint of tabasco. Jumbo shrimp dipped in egg batter, pan browned, topped with homemade marinara sauce and melted mozzarella cheese. A full plate of steamed mussels served in either red marinara sauce or white wine sauce over a generous portion of spaghetti with wedges of garlic bread. Jumbo shrimp served in a moderately spicy homemade marinara sauce over a generous portion of spaghetti with wedges of garlic bread. Tender lobster tail, shrimp and clams served in a moderately spicy homemade marinara sauce or white wine sauce over a generous portion of spaghetti with wedges of garlic bread. Jumbo shrimp bathed in a delicious blend of fresh garlic, white wine and butter served over a generous portion of spaghetti with wedges of garlic bread. Fruits of the sea! A medley of lobster, clams, jumbo shrimp, mussels and calamari served in your choice of homemade marinara sauce or white wine sauce over a generous portion of spaghetti with wedges of garlic bread. Clams on the half served in a moderately spicy red or white clam sauce over a generous portion of spaghetti with wedges of garlic bread. Always great food and wonderful staff. Looking forward to our next visit. Good varied menu, large portions, delicious bread! Staff was super attentive without being intrusive. We had a wheelchair and they were so accommodating making sure she was safe and taken care of. Cute restaurant definitely in keeping with Little Italy theme! Would definitely recommend! Best spaghetti and meat sauce I had in years! The garlic bread was out of this world! Definitely will go back. Came after went to Hippodrome for show...had not been here in while...we were hungry & said let’s go to Sab’s...Like a warm blanket Sab’s was delicious! We all had apps. (Shrimp Cocktail, app. Sampler, clams casino) perfect...Dinner was great... (veal a la beppi, large bookmaker, frutti de mare, veal parmigiana), some beers, Chianti...Stephanie was Fantastic, very personable...dessert was yummy along with espressos...we left with a big smile...great food, very affordable, we’ll be back! Disappointed with the food. Less than friendly service. We will not return. Always our favorite spot in Little Italy! Went this night to celebrate my husband's birthday. Ended up bringing one extra person than our reservation but they were happy to accommodate and moved us to to another table. Our waitress, Peachy, was attentive and sweet like a favorite Italian aunt - She made suggestions and was happy to see everyone enjoying their meals. The bookmaker salad is still the main reason why we go but our meals were delicious as well. Perfect as usual, love the bookmaker salad ! 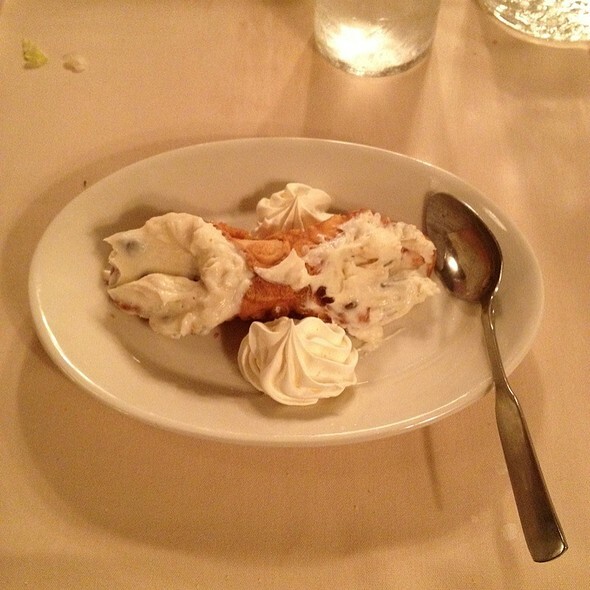 We really loved everything about our dining experience at Sabatinos! Food service and ambiance was amazing! We love this place. 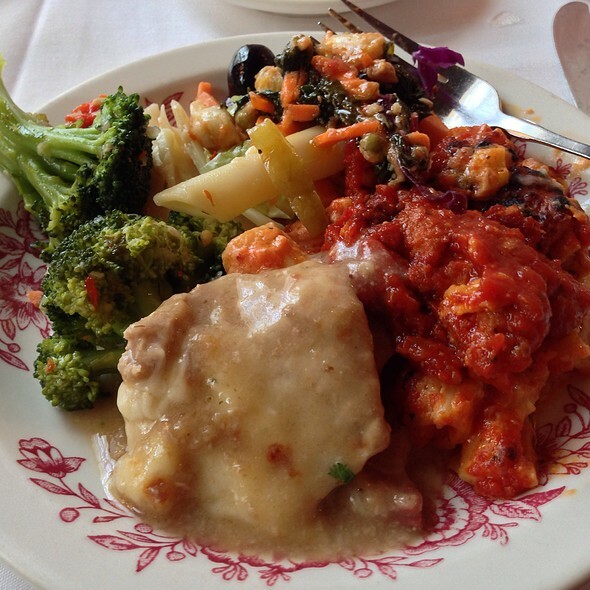 It has great old charm, great Italian food and great service . I love that it’s not just another fancy chain, just continue to do the same. It’s AWESOME!! Service was great and the lunch specials were a bonus. Sabatino's remains my wife's favorite restaurant in Baltimore's Little Italy. By the way, the Tiramisu is awesome. There just happened to be a big noisy group that was so load it killed the relaxed feeling usually gotten from here. Other than that, great as usual. this way...'this is what a restaurant should be like'. We haven’t been to Sab’s for a while and I’m disappointed to say I won’t rush back. The service was very good. The food was just, ok. Not outstanding. The lasagna had little meat, the bookmaker salad was skimpy on protein and the bread was not worth eating. I’m sad that it wasn’t better. We saw a mouse scurry across the floor and the two servers that both also saw the mouse ignored it. It seemed like it was obviously a regular occurrence! Celebrated an older person’s birthday. Asked for a quiet space and were nicely accommodated. Not good! Gnocchi was way over cooked, was basically mush. Chicken parm had zero taste. House dressing was off had a gritty feel, like too much corn starch or baking powder. Service was fine but this is a hard pass in the future. Our server, Kitty, was awesome! Horrible food served with gallons of over sweetened marinara sauce. I went hear after a concert at Royal Farms arena, so it was pretty late and choices were limited. Apparently they do karaoke every night so if you like karaoke this is a good place to try. The singing range from horrible to very good and a decent mix of types of music. The food and menus were confusing. I ordered some things off the late night menu and some off the regular menu but I feel like the prices were different. Everything was over priced. For example a small portion of eggplant Parmesan was 18 dollars and did not come with spaghetti . The side of spaghetti was like an additional 7 dollars. My girlfriend got the salmon which was good but like $30. The mozzarella sticks were horrible and the buffalo wings were okay. The ambiance is that of a bar, but the prices are fine dining. 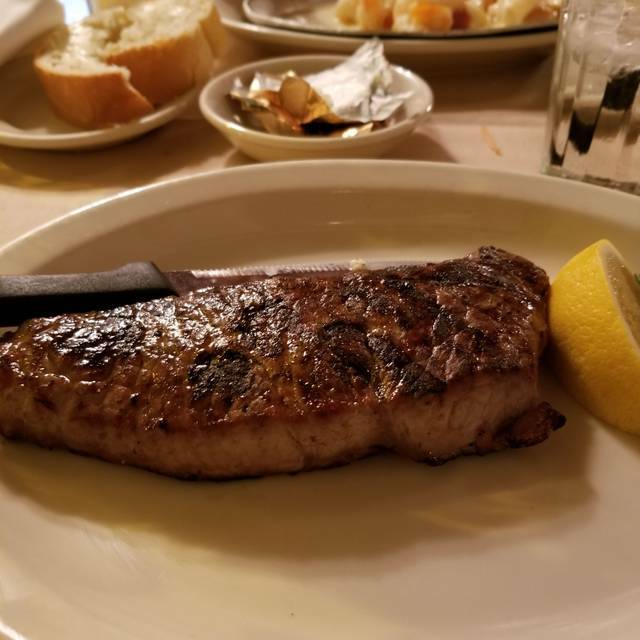 There are much better places to get steaks and Italian food for the prices they charge. Amazing food and service! Will be back when we are in town! Not a place I would recommend. Service was very rushed and the food was not good. I felt like I was eating in someone's house that hasn't been updated in 30 years. Sabatino’s is always good, and their Bookmaker Salad and house dressing are delicious, but they are a bit pricey. The restaurant itself is dated, but homey. We went to Sabatinos with a friend when we were visiting Baltimore. The food was mediocre at best and quite expensive for what we got. The house dressing which is touted as amazing (and has an upcharge) was chalky and tasteless. The service was fine, but nothing special. The restaurant is in an old building which could be nice if it was kept up. The bathrooms were not very clean, which just underscored my lackluster impression. I won’t go back on my next visit to the city. The bookmaker salad was as I remembered. The room was comfortable and our table was next to a window. We could look out at the colored lights strung over the street. Nice dinner. Garlic bread and salad was amazing!! It was our first time there as we don’t live in Baltimore. The food and the service were wonderful and I would highly recommend it to anyone! Bookmaker salad has always been delicious, it's my favorite salad for sure ! Food last year was great making us want to come back. This year for valentines day we were very disappointed in our entrees. Food did not seem fresh like usual. Went for Valentines Day food was good as well as service. Great Food! Awesome Atmosphere! Superb Service - Peachy ( 45 years of Service) was the best! What a wonderful, delightful server - made the meal/experience/atmosphere that much more enjoyable! The food was superb and the server was delightful. I recommend Sabatino’s as a great place to dine. 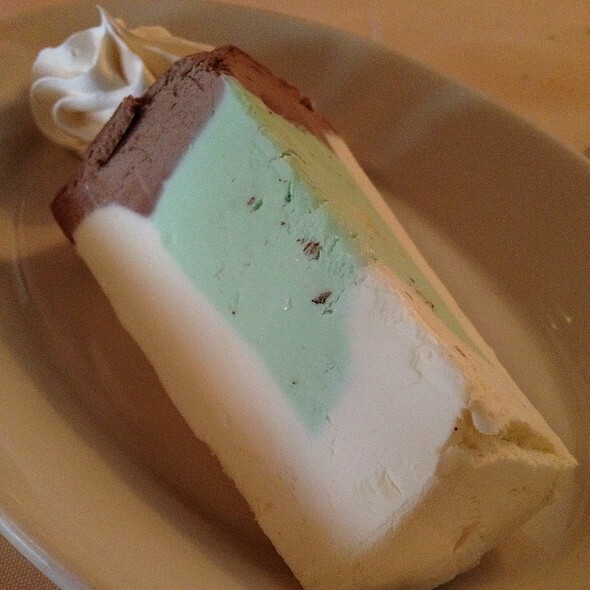 The Bookmaker salad was large enough to share and the dessert, a chocolate encased ice cream treat was perfect. Loved it except I went for escargot and they ran out. Otherwise great!